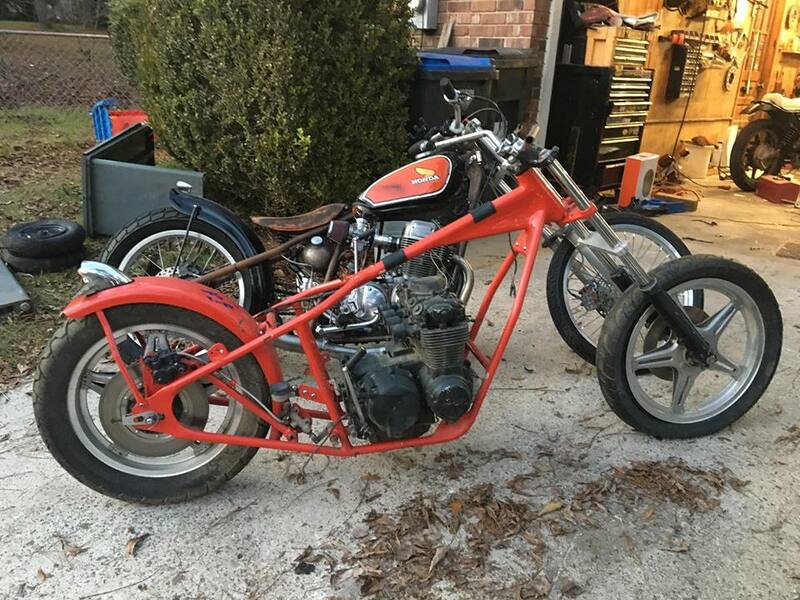 We'll begin this thread with what is currently a red, possibly Amen, chopper with a CB550 K1 engine. The motor may change. The motor may stay the same. When I open it up, I'll know more. First things first was to pull the ape hangers, which aren't worth a pic, to put in another set of bars has a holder. I like these bars, so they may stick. It will not be red by the end of the week. There is a very good chance these comstars go, too. I generally do not like comstars. I suspect the trailer fender flies away too. Anyway, for now it sits. Others are ahead in the queue, but I plan to give this bike some of my love over this winter break. Yay, winter fun to watch. I like the molded frame a lot. I also think the engine fits in there nicely.. Id you were going to replace the 550 what do you think you would throw in there? That is a nicely molded headstock. Ever thought of taking on the Comstars as a challenge? So many of them out there, I'd love to see someone make them look great. I'm thinking about it. You make a good point. They're in really good shape too. I have a set of Kawasaki rims that I may try out just for kicks. But the more I look at this thing with the Comstars, the more open I am to using them. 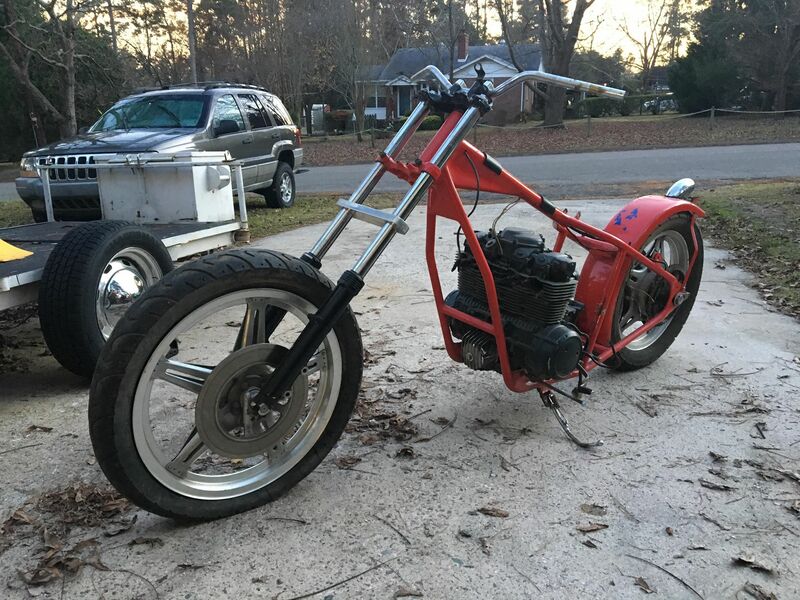 They're certainly lighter than the Kawasaki rims and I think they may be lighter than the high shoulder vintage dirt rims I got specifically for this build. I've had an itch to do a thumper. It's sort of thing within my group of buddies. I'm probably just kidding myself. These 550 motors claimed 50 bhp and they're popular enough in the racing world that there's plenty of crazy I can do with this engine. If you look in the pic I posted with the two choppers side-by-side, you'll notice they are very similar in size. There's a reason for that. This is a CB750 chopper frame. Yep. Oh, and I still have a TT500 motor in a box, ifn you wanted to go the thumper route. Aince you have the 7 fiddy chop already, do the thumper. I don't hate the red but I'd probably make it go away too. I like the forks and brace, Comstars are ..... sorry but imho, horrible. Spokes or Kawi mags would look better.